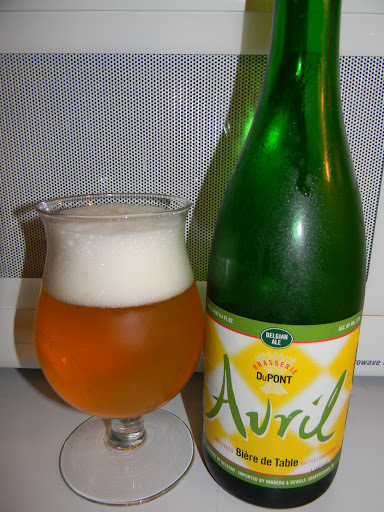 Review of Dupont Avril | Beer Apprentice - Craft Beer News, Reviews, Interviews and Info. Hello everyone. For today’s craft beer review I’m going to be sampling the DuPont Avril (Bieres de Table) produced by the Brasserie Dupont located in Tourpes, Belgium. I couldn’t find any type of commercial description from the website, brasserie-dupont.com, so I’m just going to copy the description from the back of the bottle. Bieres de Table are enjoyed at meals when the whole family gathers. Flavorful not fanciful, they complement the food, refresh the palate and season the conversation. Central to Belgium’s beer culture, they are how Belgians learn what beer tastes like and how to appreciate it. AVRIL is Brss. Dupont’s Biere de Table. Aromatic like fresh bread, full in the mouth and light on the finish. Enjoy and welcome to our table. Ok. That’s sounds nice enough. This brew comes in a 25.4 oz. bottle and it has an ABV of only 3.5%. It poured a slightly hazy, straw/golden color with a very bright white head. The texture of the collar was soft, fluffy, soapy and rocky. It formed to a nice size. The retention time was ok and the lacing was patchy, but rather clingy. The brew looked pretty good I thought. The aroma began with hints of lemon sweetness followed quickly by a flourish of grassy hops. A light tone of funk was found as well. A very clean bready smell accompanied a soft touch of hay to complete a very, very well balanced and outstanding fragrance of a beer. The taste was very nice also. The funk remained relaxed and complimentary. A lot of breadiness and grassy hop savors were the primary factors, however the lemon citrus added a touch of sweetness while just a tiny bit of peppery spice added some bite. Absolutely no sourness or tartness was found within this Saison. The mouthfeel was medium to mostly light bodied. Very clean, crisp and snappy. It wasn’t real dry though. It was super refreshing and thirst quenching. The carbonation wasn’t nearly as aggressive as I thought it might be either. It was rather soft for the entire drinking period. To finish, a solid amount of flavor was left covering the roof of the mouth and tongue after each sip (gulp). I tell ya. I really liked this beer. Like the description stated, it would pair excellently with a meal. Not to mention that it would be an excellent introductory Saison and a killer session brew for the Spring and Summer season. The drinkability was superb to say the least. I made my way through this bottle in no time flat!!! It’s, simply, a very, very light and restrained Saison/Farmhouse Ale. If you are expecting that super sour, barnyard funk type of beer, you may need to look elsewhere because the Dupont Avril does not provide that. You do get some of those characteristics, however they never dominate or try to overtake the pleasure of sipping a “comfortable” beer. I would highly recommend giving this a try if you have the opportunity and enjoy this beer for what it is. Once you do, please feel free to leave a comment and tell me about your experience. Thanks to everyone for reading and commenting. I’m so appreciative.